This twist on the traditional cabbage slaw makes the celery the star. 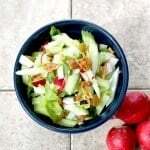 This Crispy celery slaw is perfect for summer! Always a bridesmaid, but never a bride! I know Celery has this thought every time she is added to a recipe because we recently had a long talk. Celery poured her neglected heart out to me about how she felt like the ugly cousin that gets to be a bridesmaid even though the bride doesn’t pay her any mind. 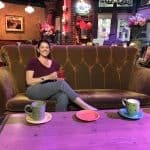 And now she doesn’t want to be asked to a party because all of her friends are invited, so the host had no choice, she wants to be invited because SHE is liked. Celery wants to be the star for once and stand on her own merits because she is worthy! Celery has opened up to me, and she has been heard! She is always added to a crudites tray but always the last section to be eaten. Added to broths and roasts for flavor, but usually strained out because she’s mushy. Added to soups for bulk but rarely for anything else. Poor Celery is rarely seen in the spotlight or on her own and now she wants to shine. I didn’t really have an “out loud” conversation with celery because that would be weird, but I do feel that I can communicate with food and thus interpret their inner thoughts. Recently I started using celery leaves as a garnish or in with salad greens as a kind of a ground floor “outreach” program for misunderstood vegetables. I have also been saving my leaves and the inside tiny stalks for soups and homemade broths, or as I call them “Social Mixers” for food. Usually, the leaves are trimmed off, like I was taught by my MA, because you “just don’t use” that part. She also told me to surgically remove the string from the celery, but I don’t have the heart for such a barbaric procedure. Celery has feelings after all! Much like radishes. Check out my Crispy Garlic Radishes! Even though Celery is bitter, like an overlooked, unwed cousin at a wedding, she tends to be more tender at heart and I like the flavor contrast that she adds. 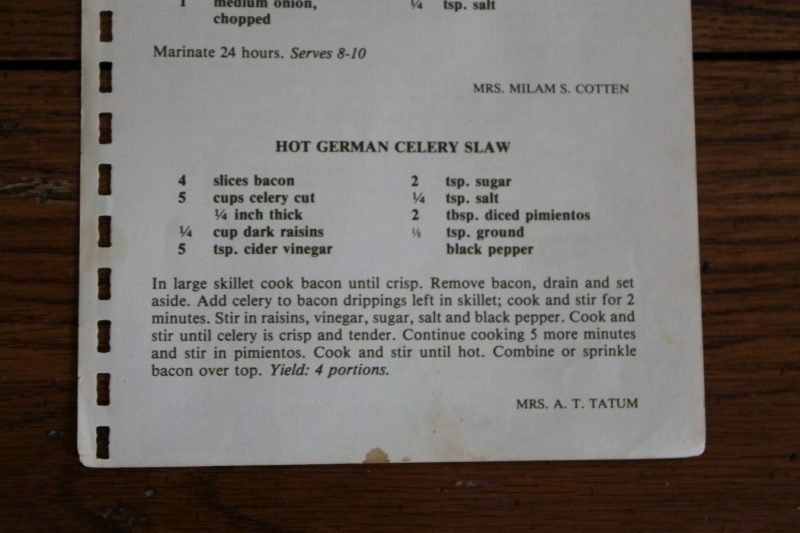 I must find a way to bring her out into society.In going through some of my MIL’s old cookbooks, I stumbled upon a recipe for a Hot German Celery Slaw. This recipe intrigued me because of the ingredients and also because it is to be served hot. In order to save her from a “mushy” showing, I decided to update it for Celery’s sake and give her the debut party she deserves. Much like giving brussels sprouts some extra love, a small addition to a classic ingredient can highlight it in a new way. This recipe for celery slaw highlights all parts of Celery, like her amazing texture and attitude. She also stays crisp longer and can hold up to the weight of a more traditional creamy dressing. She would even do a bridal gown proud! 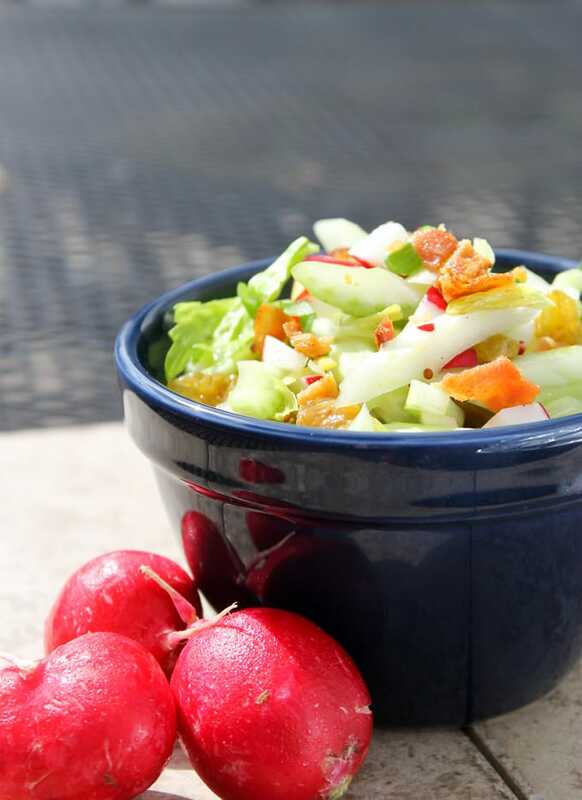 My Crispy Celery Slaw is perfect for all your summer picnics! Celery is always put on the back burner but this crispy celery slaw highlights this versatile vegetable! Cook bacon in a skillet to render the fat. When the bacon is crispy, remove to a paper towel. Mix together the cider vinegar, honey, salt, pepper, and celery salt. 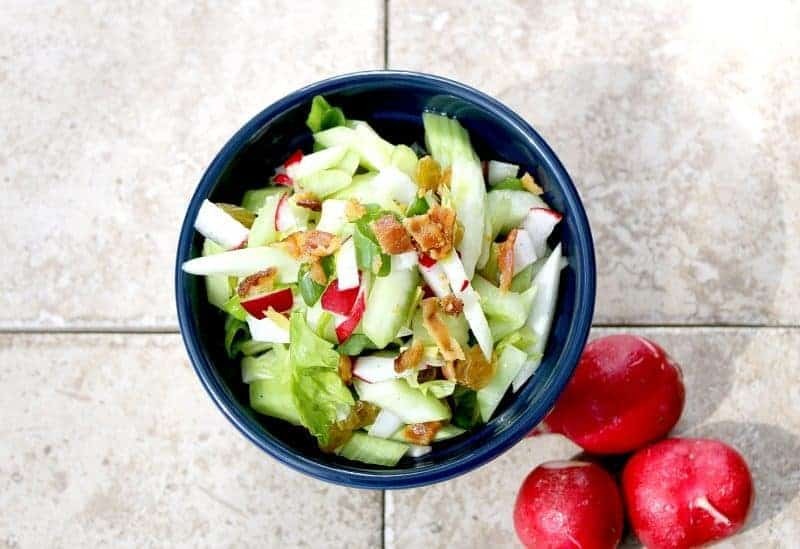 Toss the celery, green onions, bell pepper, and the raisins with the dressing. Place in serving bowls and top with bacon crumbles! I hate buying a huge stalk and only needing a few ribs. Now I can use the rest before it goes bad! I am one of those who keep celery feeling like a second class vegetable. I use it all of the time with peppers or carrots and onions. I think it’s great that you came up with a dish that lets it shine. I agree with you that celery is an under appreciated veggie, but this sounds like a great way to showcase it! Thanks Sara! I love the crunch of it too! 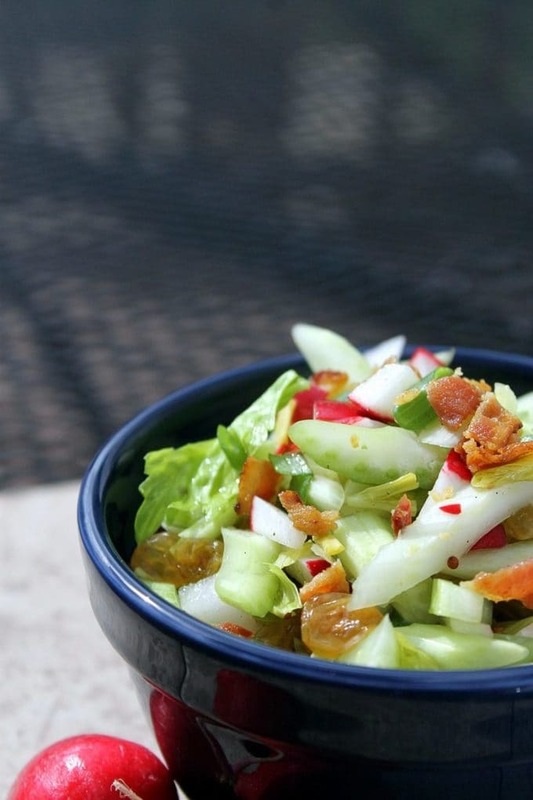 You had me at bacon 😀 Love the idea of pairing it with a flavorful celery salad! I have used it paired with broccoli so I thought I would throw it in the slaw. I am so glad that it worked! Poor celery. I’m glad you gave her a chance to shine on her own for once! Thanks Katie! I love finding new uses for things! Loving the fresh flavors here! I like the radishes in this recipe. I have been using them heavily in all my recipes lately. They are a perfect spring or summer ingredient. Your recipe is very creative. Thanks so much! They are my new go-to side dish! This looks fantastic! I am actually a celery lover and go for it first on any veggie tray. I agree that it doesn’t get used as much as it should. This is a great way to make it shine! Nicely done! I love the larger cuts and new flavor introductions for me are the bacon and raisins = winning! I loved your interpretation of poor celery here. You are right though, even though I was giggling while I was reading this.